Our printable baby shower invitations are an easy and affordable solution to your baby shower needs. Use our baby shower invitation templates to customize and print your own invitations from the comfort of your own home. We are constantly adding new designs and templates, and most all of our invitations are available in a variety of colors to match your baby shower theme or color scheme. 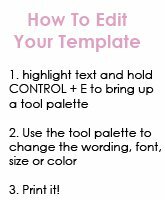 Simply download our printable template and change the wording, font, size, or even color to match your event. Print the baby shower invitation templates onto card stock for a fast and easy invitation that will look beautiful. All you need to do is print, trim, and cut in half. Go one step further for an extra special invitation! Print the template onto high quality 24 lb. paper. Trim and cut the invitation template and attach it to a colored card stock backing. You can even add ribbons and bows, or small flowers or charms. All of our invitation templates are set up two to a page and are ready to be instantly downloaded and printed onto 8 1/2" by 11" paper or card stock. These files come in the form of an electronic PDF file. You'll need a PDF reader in order to view and print these files. I recommend downloading the latest version of Adobe Reader.